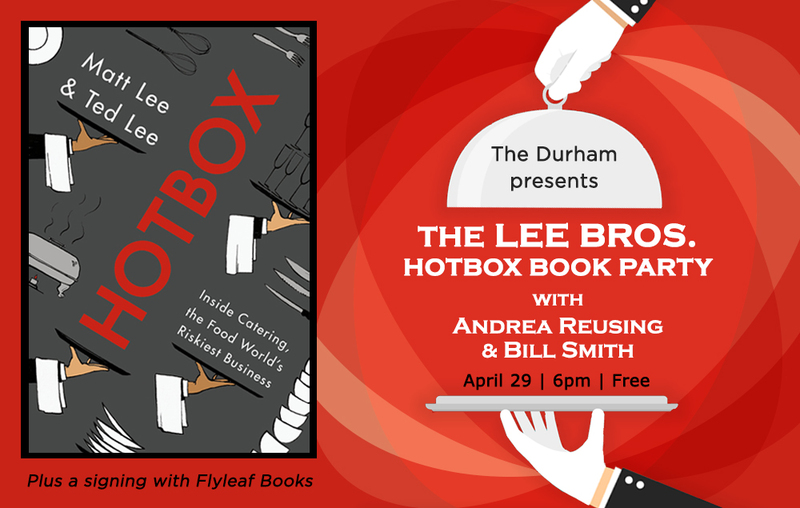 We’re welcoming The Lee Bros. to The Durham for a cocktail party to celebrate their latest release, Hotbox: Inside Catering, the Food World’s Riskiest Business. Join us for drinks, snacks from The Durham and an insider conversation with Matt and Ted Lee, Bill Smith of Crooks Corner and Andrea Reusing of The Durham. Hotbox will be available for purchase courtesy of Flyleaf Books. Siblings Matt and Ted grew up in Charleston, South Carolina. When they left to attend colleges in the Northeast, they so missed the foods of their hometown that they founded The Lee Bros. Boiled Peanuts Catalogue, a mail-order catalogue for southern pantry staples like stone-ground grits, fig preserves, and, of course, boiled peanuts. When an editor of a travel magazine asked them to write a story about road-tripping their home state in search of great food, they embarked on a second career as food and travel journalists. They have a cable TV show, “Southern Uncovered with The Lee Bros” on Ovation network, and were commentators on all 7 seasons of “Unique Eats” on Cooking Channel. They contribute to magazines like Travel + Leisure, Bon Appetit, Saveur, Garden & Gun, and Martha Stewart Living, and for The New York Times, Food & Wine, and Southern Living, among other publications.